The Sustainable Development Goals (SDGs), also known as Global Goals for Sustainable Development, are a collection of 17 goals set by the United Nations General Assembly that make an urgent call for action by all countries, both developed and developing, for sustainable development globally. In 2015, the United Nations member countries signed on to the 17 goals, with 169 targets, to be achieved by all UN member states by 2030. These goals replaced the Millennium Development Goals (MDGs), which started a global effort in September 2000 to tackle the indignity of poverty. The goals recognise that for the world to know peace there should be zero hunger, good health and well-being, quality education, gender equality and no poverty by the year 2030. Other goals include clean water and sanitation, affordable and clean energy, decent work and economic growth, industry and innovation. The rest are sustainable cities and communities, responsible consumption and production, climate action, life below water, life on land, peace, justice and strong institutions and partnerships for the goals. Recently, the Minister of Planning, Professor George Gyan-Bafour, launched Ghana’s first voluntary national review (VNR) into how it is implementing the SDGs. The review was to reflect the achievements and contributions of state and non-state organisations to the 17 global goals and their 169 targets. Speaking at the media launch of Ghana’s VNR process in Accra, Prof. Gyan-Bafour explained that Ghana volunteered to review national progress towards the SDGs in response to Paragraph 79 of the 2030 Agenda for Sustainable Development. He said the review would appraise the institutional arrangement and enabling environment for implementing the SDGs. Ghana has set up a 15-member High Level Ministerial Committee to oversee the implementation of the SDGs in country. In 2018, Ghana prepared its SDGs baseline report to provide a reference point for tracking progress towards achieving the SDG targets and the corresponding Agenda 2063 targets. 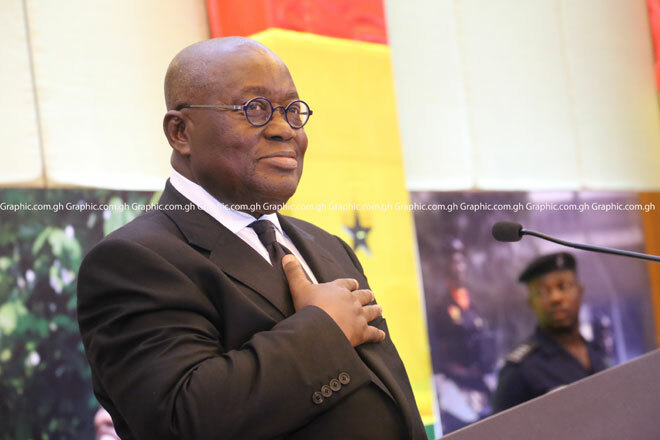 President Nana Addo Dankwa Akufo-Addo, who is currently the Co-chair of the UN Secretary General’s Eminent Group of Advocates, has through his role organised a number of events to mobilise support among African leaders and businesses for the SDGs. Addressing African leaders on the sidelines of the ongoing African Union Summit in Addis Ababa, Ethiopia, President Akufo-Addo noted that the founding fathers adopted the then Organisation of African Union Unity (OAU) Charter with the overarching aim to attain freedom, equality, justice, dignity and the economic transformation of the continent to be driven by its immense natural and human resources. During the launch of Ghana’s first voluntary national review (VNR) into how it is implementing the SDGs, Prof. Gyan-Bafour expressed concern over the low level of awareness and knowledge of the SDGs among the public and, therefore, called on the media to use their various platforms to propagate the SDGs and advance awareness among the public. For his part, President Akufo-Addo has underscored the need to fully capture the ambitions of Africans by taking advantage of the opportunities that the SDGs presents. He admonished African leaders to strengthen their commitment and scale-up the momentum in the implementation of the 2030 United Nations Sustainable Development Goals (SDGs). Indeed, the implementation of the SDGs is the best way to guarantee progress for the people.